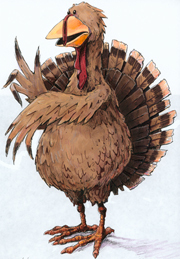 Foster Farms Chickens- Who doesn't love 'em? The Foster Imposters are BACK! 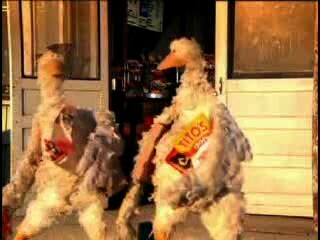 After a 2 year hiatus, the Foster Imposters came back on the scene in '06 with a new Advertising push, including a revamped website and a 4-pack of new spots, 2 for the English speaking market, and 2 for the Hispanic market. 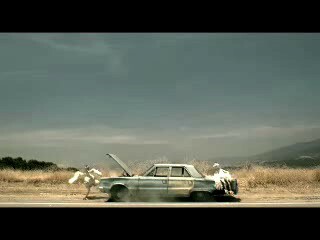 You can now see them again, careening across country in their banged-up Plymouth Belvedere, swilling liqui-cheese at the local Mini Mart, defending themselves on a daytime talk show, digging their way into Foster Farms, and hanging out with popular EMI Latin recording artists Los Tucanes, all thanks to the good folks at Foster Farms! 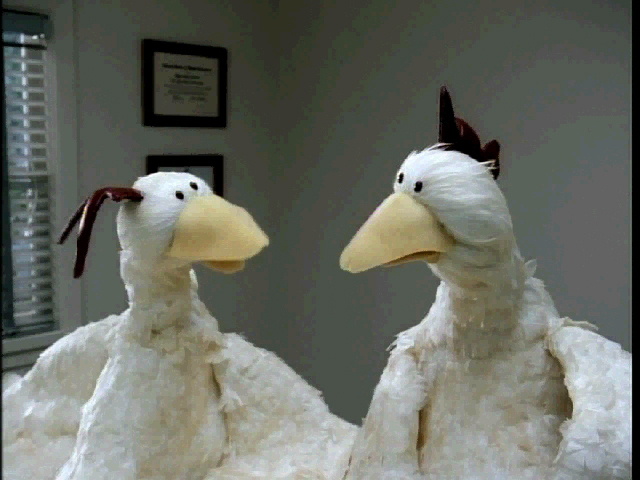 All motion clips are copyright 2006 Foster Farms, Inc.
As pitched to Foster Corporate by Goodby&Silverstein creatives Bob Kerstetter and Tom Routson, the idea of a pair of scruffy chickens trying to bluff their way around with bogus chicken creds was originally rejected. Then again. And again. And again. Somehow, attention came back to the concept. Teaming up with Red Dog Films' Marc Chiat, Goodby contracted Rick Lazzarini and The Character Shop to design and develop a unique couple of crazy chicken puppets, and soon the Foster Imposters were born. 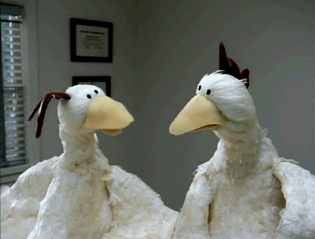 Though Foster Farms Chicken is only sold in a small 3 state region (California, Nevada, and Oregon) the Foster Imposters campaign has drawn nationwide acclaim and recognition. They are beloved by millions of West Coasters, and recently celebrated their *13th year* on the scene. 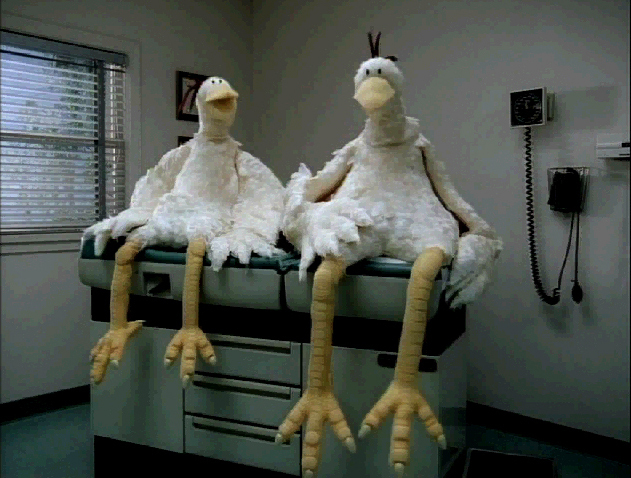 During that time, we shot many, many spots promoting the fact that Foster Farms are always fresh, never frozen, and corn fed, by contrasting it with a pair of unkempt, junk-food eatin' identity thieves, always intent on trying to have some of the Foster magic rub off on them. At one time, they were the West's most recognized advertising characters since the California Raisins™. 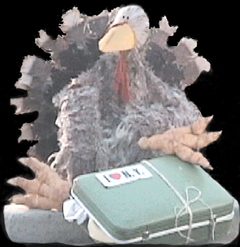 In 2000, the Imposters were joined by a Turkey "cousin", who went on trial for smuggling himself into LAX via the luggage carousel. 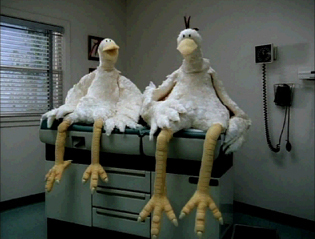 While TCS is known for their innovation and use of ground-breaking animatronic technology, the Foster Farms Chickens harken back to pure, simple Old School puppetry. 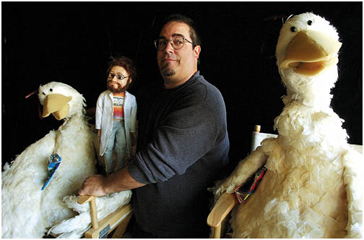 They are made from foam, fabric, and feathers, and require direct hand operation by two puppeteers apiece. One puppeteer works the head, and another the arm/wings. Those puppeteers had been the same for an entire 10 year period: Rick Lazzarini, Drew Massey, Terri Hardin, and Anton Rupprecht. Sadly, Anton passed away 3 years ago, and we all miss him very much. In all those years, the Imposters have gotten into and out of some crazy scrapes: Stopped by cops, run from cops, choked in a tattoo parlor, driven in a beater sedan filled with ice, dived into dumpsters, attempted alleyway liposuction, marinated in a kiddie pool, wrapped in plastic, basted into a washing machine, poked and prodded in a Doctor's ofice, crashed a Yoga session, busted in a motel room, binged on junk food, and much more. We have an absolute blast every time we shoot one of these commercials!